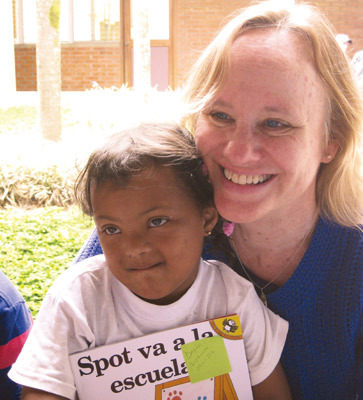 In 2003, Carol Dale, ’94 Occupational Therapy, traveled to Honduras as part of an Olancho Aid Foundation mission team. “It was a tough trip in many ways,” she says. “I’d not experienced the depth of poverty I saw there.” This spring marks Dale’s tenth trip to the country, where she and other volunteers continue to work to support and outfit schools and provide medical supplies, equipment and nutritional supplements for Hondurans in need. An occupational therapist in the Acute Care Department at Catholic Medical Center in Manchester, N.H., Dale now serves on Olancho’s board of directors and helped the foundation gain nonprofit status in 2009. She is currently fundraising for scholarships that will enable more students to attend Escuelita Nazareth, the only school in the Department of Olancho, Honduras, built to serve special needs children. The tuition for each student is $900 a year. Read on to learn about how the Olancho Aid Foundation is improving lives in Honduras. It was a decision Carol Dale and her husband did not take lightly: moving from Northern California with their two children to be closer to extended family in New Hampshire. “I remember saying to my husband at the time, ‘How are we going to surround our children with ethnic and economic diversity in a state that is 98 percent white?’ It was our choice to move but, at the same time, we had responsibilities as parents,” Dale says. Once settled in New Hampshire, Dale began volunteering with the Roman Catholic-affiliated Olancho Aid Foundation. Initially providing support for the mission from her home base, she made her first trip to Honduras in 2003 with a 10-member team that included a postal worker, a nurse, a gentlemen who worked for Coca Cola and Dale’s 16-year-old son. “On our return flight home, before we had landed on U.S. soil, my son turned and said to me: ‘I want to go back, Mom,’” Dale recalls. Since that time, Dale’s son and daughter have participated in multiple in-country humanitarian missions, and Dale’s husband contributes U.S. support. In a country where there is no government-mandated education or services for special needs children, the Olancho Aid Foundation built and maintains Escuelita Nazareth, a special needs school. Sixty students now attend Nazareth, double the enrollment ten years ago. Dale’s background in occupational therapy has been a valuable asset in working with special needs children and their families. An especially poignant moment: witnessing both a six-year-old, severely impacted by cerebral palsy, and his mother benefit from an adaptive stroller. Volunteer or donate. Or email Dale. B.S.Environmental Studies – 1981; M.S. Mass Communication – 1987 I read Carol Dale’s story with interest. I went into Peace Corps in Honduras in 1982 and ended up staying in Honduras for 17 years. It is a wonderful country with Beautiful people and it changes the lives of those fortunate enough to step foot on her shores. I encourage anyone whose situation permits it to volunteer overseas and if you are fortunate enough you may find yourself in a country as special as Honduras. Thanks for your feedback, Raymond! I’d love to hear more about your time in Honduras. If you have the time and inclination, please send me an email at wsqeditor@sjsu.edu.